Recently a coworker alerted me to the existence of yEd, an awesome free graphing program written in Java. 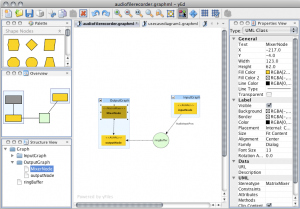 It creates GraphML-format files using a slick, well-designed interface. 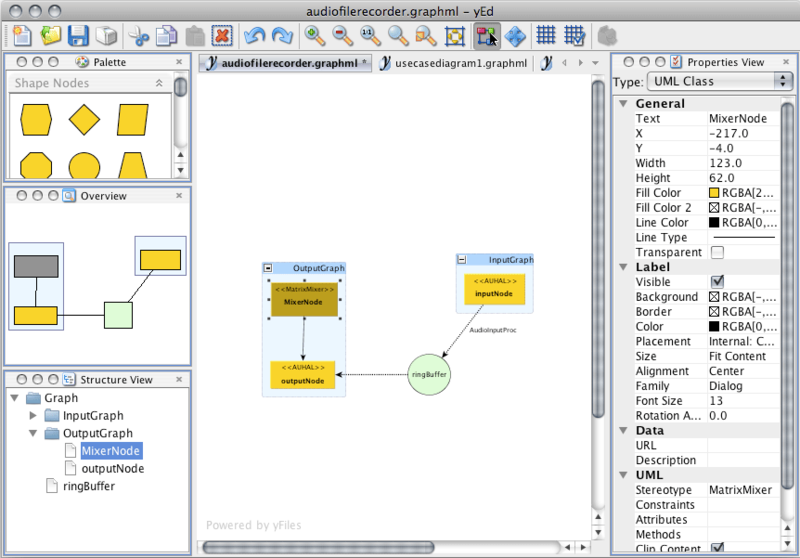 It has powerful graph-organizing tools and supports SVG symbols as graph nodes. The graphs look great when printed, too. 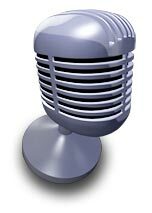 WordRecorder was a program I wrote for my friend Matt to help him record hundreds of spoken names for his video e-card site. It’s a pretty specialized program and I doubt more than a handful of people out there will actually have a need for it, but the source code may be of use to people trying to figure out how to use Apple’s CoreAudio Frameworks and the Qt Interface Toolkit. I’ll try to post more details about its design and how it works in the coming days. For now, visit the main WordRecorder page here. Make your Xcode project using qmake -spec macx-xcode if you haven’t already. Open/reload the resulting project in XCode 3. 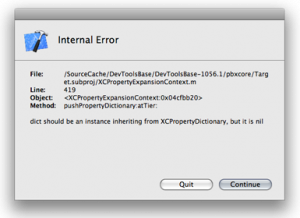 Trying to edit the project properties will yield the above error. Save the Project. This step is necessary as it makes Xcode totally reformat the file making the edit we’re about to do much easier. Open the project’s “project.pbxproj” file in your text editor. It lives inside the “.xcodeproject” folder so you’ll have to do a “Show Package Contents” to see it in the Finder. Go back to Xcode. It should prompt you to reload the project from disk. Reload it. You should now be able to edit your project’s properties again. Unfortunately you will have to repeat this step whenever you rebuild your project using qmake. I don’t know why this fix works, but it beats having to recreate our Xcode project by hand, and everything still seems to build without incident after the fix. I’m not sure if this is Apple or Trolltech’s problem as I can’t remember if this worked in Qt 4.3.3 / Xcode 2. Xcode 3 probably isn’t officially supported by qmake yet, anyway. So a while ago I bought an HP 6800 Inkjet Printer with the double sided printing option. It’s great, but the default HP drivers don’t support the double sided printing, so the extra money spent on that hardware is essentially wasted if you use a Mac. A solution comes from the Open Printing Workgroup at the Linux Foundation. By first installing the ESP Ghostscript and Foomatic RIP packages on their website, you can install the hpijs package—too many names, yes. This gives you the hpijs driver for the Deskjet 6800 (and many other printers) with the double-sided option enabled. I’ve found the hpijs driver isn’t as crisp as the HP drivers (HP Inkjet 3.3.1), and it’s even failed miserably when I’ve tried to print some more complicated PDF files, but otherwise it’s a great way to save paper when printing things like receipts and news articles where quality isn’t my highest priority. 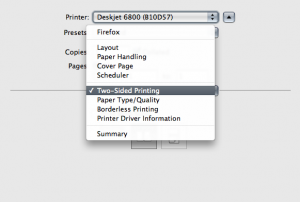 UPDATE: A recent upgrade of the HP Printer Drivers for OS X has fixed this problem. The specific driver is called “HP Inkjet Version 3.3.3”. While the standard print dialog still has the “Two Sided:” option grayed-out under the Layout tab, a new “Two-sided Printing” tab has appeared in the dropdown list. This one is enabled and actually seems to work properly.